Educating and helping has long been the most effective way for businesses to attract new customers and ultimately win their trust and loyalty. Perhaps nowhere is education needed more desperately than in financial services. According to a Forbes article on financial literacy, 44 percent of Americans don’t have enough cash to cover a $400 emergency, 43 percent of student loan borrowers aren’t making payments, and 33 percent of American adults have $0 saved for retirement. Financial education is scarcely happening in our schools or universities, leaving a massive gap that financial firms of all types and sizes have attempted to bridge in recent years. Established major banks, online banks, and fintech startups alike have turned to content marketing to attract Generations X, Y, and Z to their websites or apps and generate new leads and customers for their financial products. The good news for financial marketers aspiring to create educational centers at their credit union, community bank, or investment advisory is this: You don’t need to have a $275 billion market cap or be venture-backed by an NBA player to build killer content that generates leads. With long-form content, you can stand out from well-heeled competitors and build trust with your community. We live in a world where information is most widely consumed via short videos, headlines, images, and tweets. So, why is investing time and money into building long-form content a winning marketing strategy for regional banks, community banks, credit unions, and other financial institutions? Long-form content pieces are comprehensive articles that explore one topic in its entirety. The main goal of these in-depth articles is to outrank competing articles for search engine ranking position by providing more complete answers to searcher questions. They are designed to contain content that website users and Google's algorithm will consider to be head and shoulders above their closest competition. Here’s an example: Company A writes a 1,500-word article on a topic and dives into 10 subtopics that relate to that core topic. Company B, looking to outrank Company A, would write a 5,000-word article on the same topic and dive into 20 subtopics and also include infographics or videos to make it even more engaging for their audience. The most common types of long-form content are ultimate how-to guides, comprehensive “best of” lists, and original research. Long-form content pages are often referred to as 'pillar pages' and are designed to be website traffic magnets. They are written to answer questions that searchers are asking on Google and to provide the very best resources available on a given topic. Content on pillar pages is un-gated, meaning users don’t have to fill out a form to access this content. 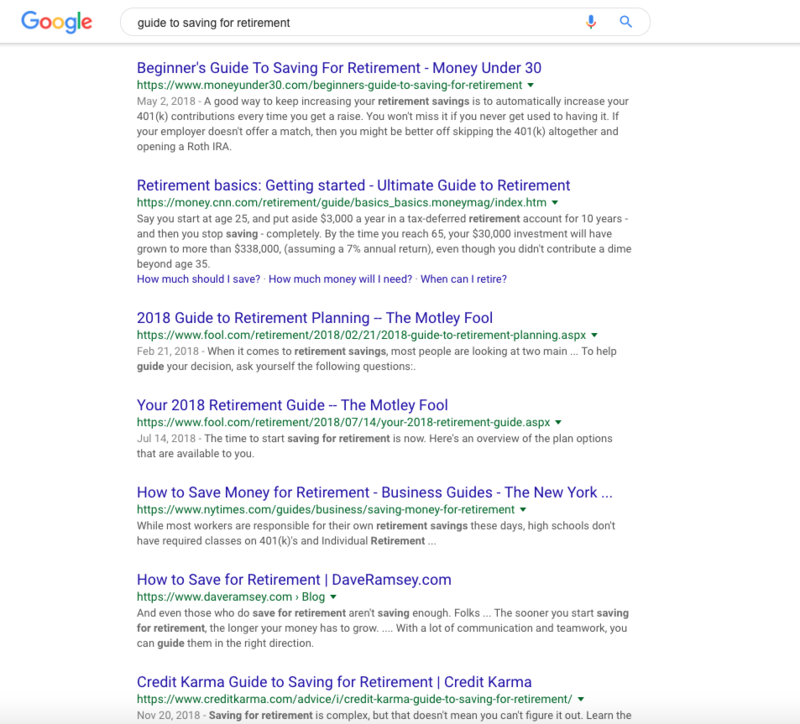 Amazingly, the website moneyunder30.com beat out CNN, The New York Times, Credit Karma, US News, and Consumer Reports, and is ranked #1 for that search term. Think your company’s website can’t compete online against larger, more well-funded marketing teams? This proves you can! There are so many benefits of producing long-form content, but there may be none more impactful to revenue than Google ranking your article on the first page of search results. In a recent article, Backlinko highlighted 200 of the most important Google ranking factors. Of those, long-form content checks the box of five of the most crucial factors. Content Length: Articles of 2,000+ words correlate to higher Google SERP. Table of Contents: When long articles require a table of contents, the table of contents give Google a better understanding of the article, enabling you to potentially rank for more relevant search terms. Depth of Topic Coverage: Pillar pages, guides, or case studies that cover a topic more comprehensively are correlated with better Google rankings. Site Usability: The length of time a user spends on your site sends Google signals regarding the helpfulness and ease of navigation of your website. Google’s ultimate goal is to match searcher intent, and if your article does that consistently better than your competitors, you’ll rise! Backlinks: The more informative your article, the better chance you have that other websites will link to your resource. Having more links from other quality websites sends signals to Google that your article is authoritative and deserving of a higher SERP. Marketers today are under a lot of pressure to generate leads and are often pressed for time. In other words, we’re all crazy busy! That’s why long-form content is so useful. By investing in one great, long article that comprehensively dives into every facet of a topic, you’ve set yourself up for a whole lot of repurposing. You can repurpose your long-form content in many different ways, including but not limited to: social media posts, blog posts, premium downloadable offers, guest blog posts, infographics, and videos. Long-form content is a foundational way that trust can be built as prospective customers start their relationship with your bank online. It’s not about asking them to take out a loan or selling them on your 12-month CDs. You’re simply answering prospects’ and customers’ questions about what matters to them: saving for college, buying a car, building an emergency fund, securing their financial future, and so on. If you have the budget to invest in truly experiential content, look no further than Ceros. It’s a content creation platform enabling marketers to “create immersive content experiences without traditional development or code” and then integrate with your CMS, such as HubSpot, WordPress, or Marketo. Infographics are an extremely effective way to capture your web visitors’ attention! This article from the Journal of Marketing Management lays out some basic steps you can take to turn an article into an infographic. Social sharing is key to attracting more visitors to your article, and infographics are liked and shared three times more than any other type of content. You don’t need a designer or content creation platform to create GIFs that make your articles more engaging. This article uses GIFs to explain how topic cluster strategies work. The New York Times does an incredible job bringing their stories to life with graphs that represent the facts their journalists uncover. By creating a video or series of videos on your long-form article topic, you’ll amplify the reach of your content endlessly. Uploading to YouTube will help you capture video search traffic and your written article will be enhanced by embedding the YouTube video like Hubspot does here. There are a number of HubSpot tools that bank marketers can use, but perhaps none are more effective for converting visitors on long-form content than Pop-Up Forms. Pop-Up Forms are CTA offers that pop up, slide in, or slide down on a browser based on user actions. If a website visitor moves their mouse to the top of the browser as if to exit, you can configure a pop-up to appear on screen with an offer to “Download the Guide” or “Request a Demo.” Always remember to create a pop-up offer that is closely related to the topic of your long-form content. Ideally, the pop-up offer will be a natural, relevant next step for your user on their journey. Include a form in several places throughout the article, giving users the option to download a related piece of content. After a user reads 10-25 percent of the article, your embedded form can essentially gate the rest of the article. After filling out the form, the user can then access the remainder of the article. This final option is a bit more difficult to implement and you risk frustrating users and driving down time-on-page (a Google ranking factor). Another way to convert visitors is by including CTA images throughout your long-form article to drive people to another landing page where they can complete a form in exchange for additional content. CTA images should be designed to offer something of premium value that compels website visitors to take the next step to learn more. Depending on the page layout you use to publish your long-form content, there could be an opportunity to use the sidebar (20 percent of the page on the right or left side) to highlight additional relevant content that a user might be interested in clicking on. This is valuable space that shouldn’t be wasted! Quizzes, blog subscriber forms, and surveys are all great options for engaging via the sidebar. If your page design doesn’t include a sidebar, another option is to use widgets that stick to the side of the browser as users scroll and provide links to view more information or share on social media. The initial conversion of a stranger on your website into a contact in your database is a huge step! But don’t forget to leverage marketing automation tools to nurture your leads, educate them further, and make them aware of the resources your firm has to help them meet their financial goals. Dan Quirk Dan is a Marketing Strategist based in Pittsburgh, PA. Prior to SmartBug, he spent 5+ years directing demand generation for a growth stage B2B SaaS company and earned a Marketing Strategy certification from Cornell University along the way. 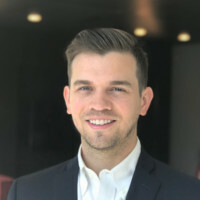 Dan is especially passionate about conversion rate optimization at every stage of the funnel and unifying sales and marketing teams around shared revenue goals. Read more articles by Dan Quirk.